I consider all rooms in our home a work in progress. I am always adding new decor and moving things around. My son's nursery is no exception. 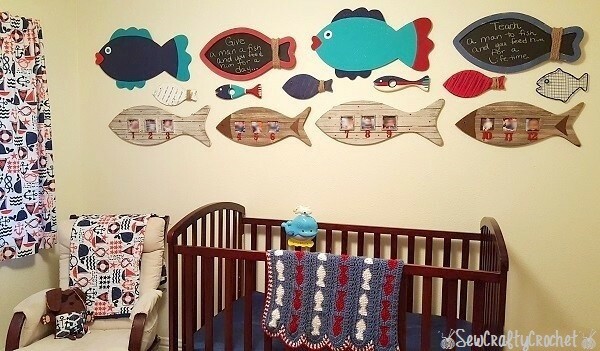 I added fish to the wall above his crib in his nautical nursery. Since I made him a crochet fish blanket, I feel that these fish really go well with the theme of his nursery. 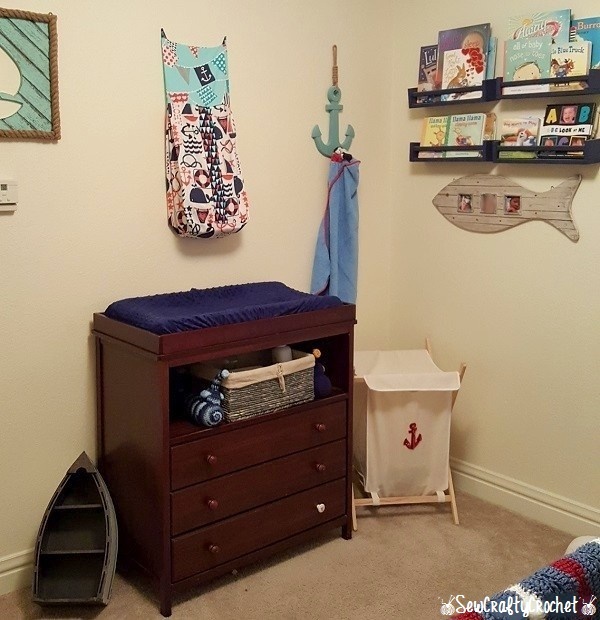 I'm sure I'll be making changes to his nursery again when he outgrows his crib and moves on to a toddler bed. 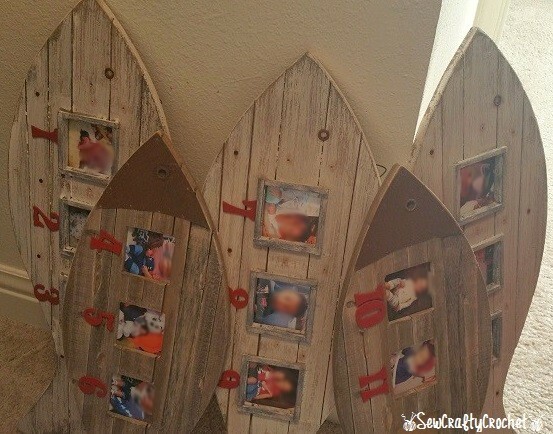 I wanted a creative way to display pictures of my son at 1 month old, 2 months old, etc. So when I found the white fish photo frames, I just had to get them. I was only able to find 3, but I since each frame has spots of 3 photos, I needed 4. So I eventually went online and found a similar frame. The darker frames had metal hooks, and I removed those and tried to cover the holes where the hooks once were with the numbers. I was going to alternate the colors of the numbers, but I decide to paint them all red. 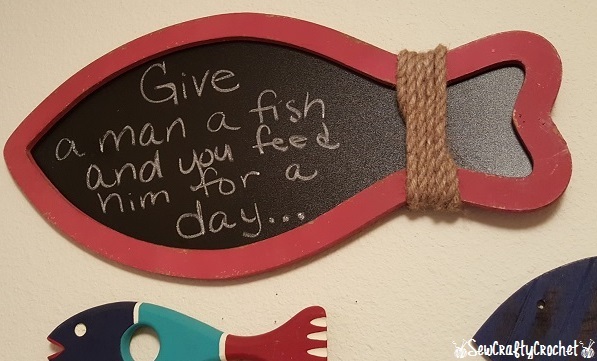 I found two fish like this during separate trips to the Goodwill. 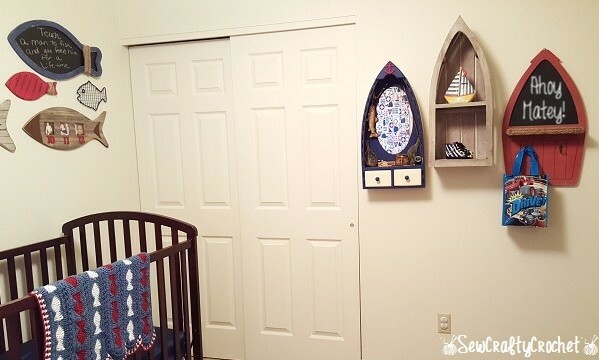 I painted them to match the color scheme of my son's nautical nursery. 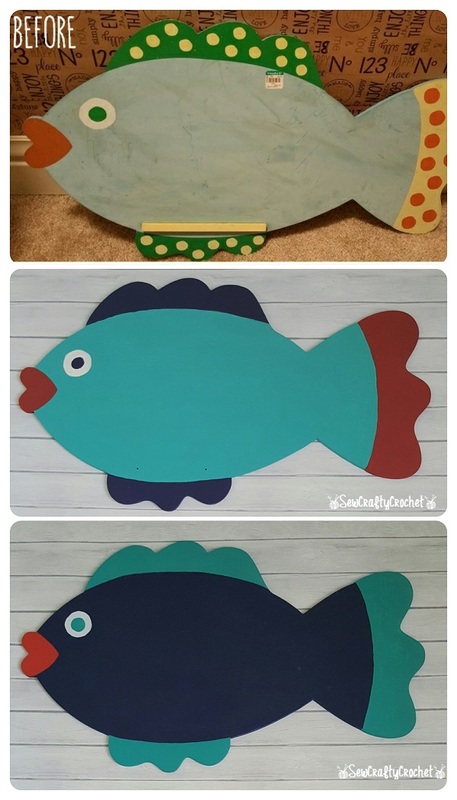 A friend found these fish for me at Goodwill. I really like the way these turned out. 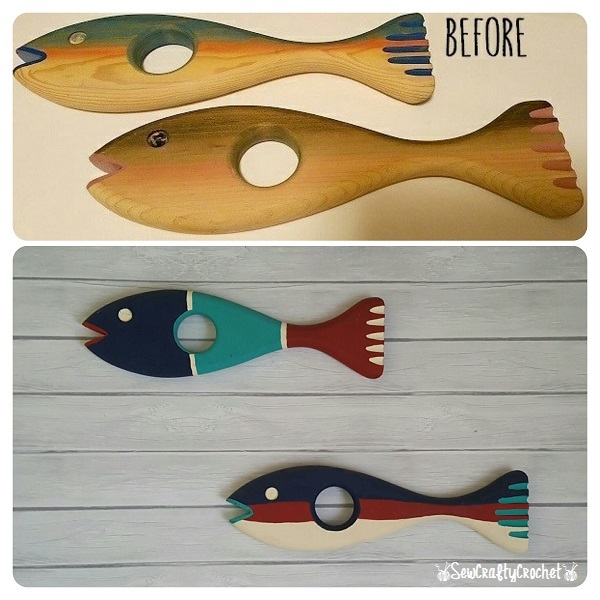 These fish were glued together, but I detached them and touched up the paint where the glue was and hung them on the wall separately. 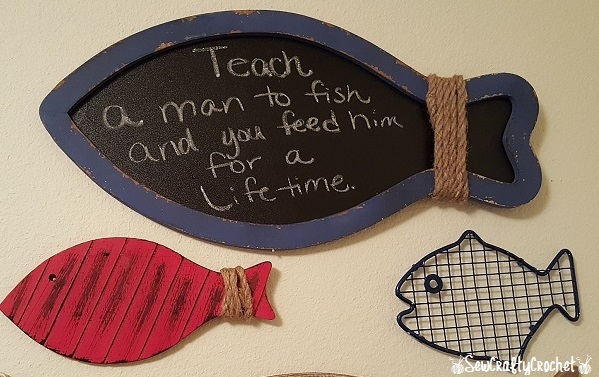 ...Teach a man to fish and you feed him for a lifetime." Also the blue grid fish used to be white, and I think it's a trivet. 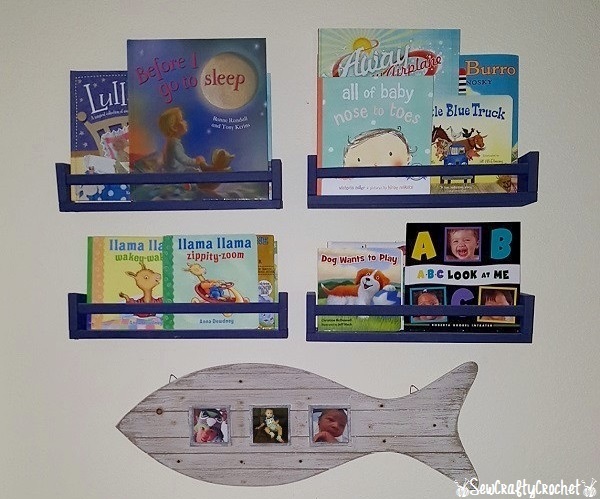 I put the extra fish frame under the Ikea spice rack book shelves. For Christmas, my friend bought me the red chalkboard boat shaped shelf. 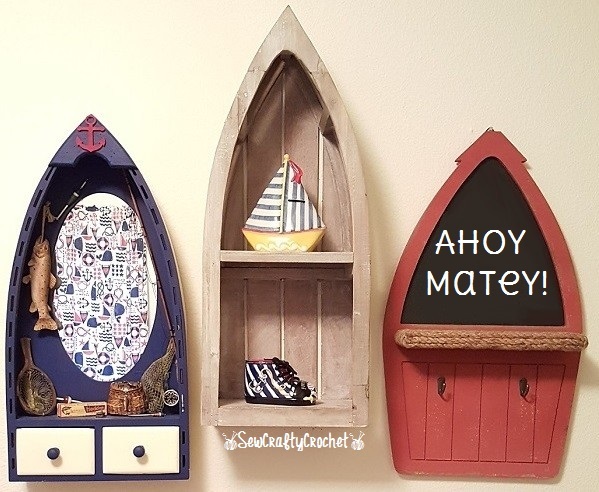 I considered putting it in my craft room, but I realized I had no room on the wall for it, so I hung it on the wall with my son's other boats. Since it had hooks, I hang his coat and diaper bag from it. The blue and white boat was purchased at Goodwill, and it used to be green. I bought the boat shelf in the middle while visiting my family, and it holds my son's boat and nautical bootie piggy banks. In this photo, you can see Patches the Pirate Puppy, the Ahoy Matey Quilt, and the Crochet Fish Baby Blanket I made for my son. In this picture, you can see the diaper stacker I made for my son. I also wanted to make his hamper, but I decided to buy a plain one, and I added a red anchor to it. So that's my son's nursery. He's 15 months old now, so I know he'll be in a toddler bed before I know it. So I'll share an update when that time comes. They grow up so fast!